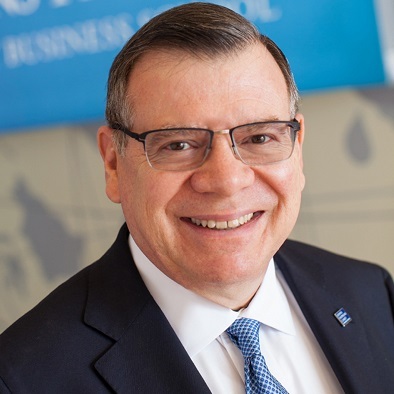 Bernard T. Ferrari, who has led the Johns Hopkins Carey Business School through a period of exceptional growth in more than six years as dean, announced today that he will retire on July 1, 2019. Ferrari joined Carey in 2012, becoming the school’s second dean. Under his leadership, Carey’s full-time enrollment grew by more than 400 percent, the number of full-time faculty members increased from 39 to more than 100, and programming significantly expanded for both in-person and online students. The school now has more than 2,300 full- and part-time students representing more than 60 countries. In 2017, 10 years after it first opened, the Carey Business School earned accreditation from the Association to Advance Collegiate Schools of Business, the leading authority on quality assurance for business school programs. “This critical recognition for the Carey Business School after just 10 years in existence is a testament to Bernie’s ability to drive progress across all functions of an institution,” JHU President Ronald J. Daniels and Provost Sunil Kumar wrote in a message to the university community today announcing Ferrari’s retirement. Ferrari, 70, arrived at Johns Hopkins after a distinguished career in medicine and consulting—he was a surgeon, COO of a medical center, senior partner at the global management consulting firm McKinsey & Company, and chairman of his own business consultancy firm. During Ferrari’s tenure, Carey expanded and strengthened its full-time offerings, adding specialized Master of Science programs in finance, marketing, business analytics, information systems, and health care management. The school also developed interdisciplinary MBA degrees that leverage the expertise of other Johns Hopkins divisions, including the schools of Medicine, Public Health, Nursing, and Arts and Sciences. Ferrari deepened and intensified the Carey Business School’s commitment to academic research by growing the ranks of research faculty and adding five endowed faculty positions. Carey is also on sound financial footing, having increased its endowment eight-fold over the past six-plus years. In recent years, Ferrari has worked with faculty and staff from across the school to develop a long-term strategic plan that will be launched this spring and “help guide the school’s success for years to come,” Daniels and Kumar wrote. Information on the search for the next dean of the Carey Business School will be announced at a later date, Daniels and Kumar said.